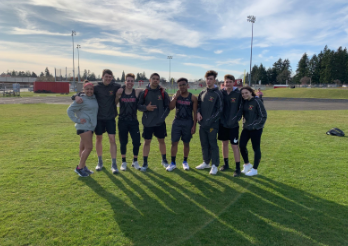 The boys and girls track team took two dominant victories over the Evergreen Plainsmen and had some great performances. The girls team won with a 102-2 victory. Standouts for the girls team included Anna Neal winning triple jump, as well as Meri Dunford, Lainne Wilkins, and Allison Schaefer all took two first place finishes. The rest of the girls team did great as well providing some great performances that helped with the win. For the boys team Nolan Mickenham who won three individual events and anchored the winning 4×100 relay, along with wins by Brent Phillips, Darius Dancel, Alex Richter, Kenneth Ogbeama, A.J. Dixon, Luke Lund, and many others for the 122 to 23 team win. Junior, Meri Dunford who won two events for the Falcons said, “everyone performed well and we used our own team as competition.” She also commented that she is excited to see the results of many on team seeing that many can make it on to the state meet this year. Senior, Nolan Mickenham commented that, “the meet went well and a lot of the team had a good showing.” He also explained that he is excited for the rest of the season. 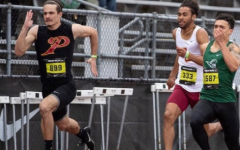 This years track and field team is strong with a lot of potential going into postseason. The teams next meet won’t be for two weeks because of spring break, but I hope you come out and support when the competition starts commencing again!